Dave Brailsford, Team GB Cycling Performance Director attributes much of his teams’ recent Olympic success to incremental improvements. The principle of incremental improvements across the cycling team came from the idea that if you broke down everything you could think of that goes into riding a bike, and then improved it by 1%, you will get a significant increase when you put them all together. This concept of incremental improvement or ‘aggregating marginal gains’ in sport is not new, but it has not been included into every element of a training strategy with such conviction before. GB Cycling’s training included rigorous training schedules to improve physical fitness, a carefully planned diet, a series of marginal technical improvements to equipment and working with psychologists to adopt a winning mindset (which included reducing the number of racing days but competing in those fewer races with a focus on winning). Brailsford also highlighted the importance of other things that might seem of little importance, like sleeping in the right position, having the same pillow when you are away, training in different places and being scrupulous about hygiene so as to reduce the chances of getting ill.
For me, the team’s success is about the sum of the parts including; the dedication of the cyclists and the coaches, the physical training schedule, the best equipment, working with psychologists to ensure that cyclists were focused on success and the hard work and constant striving to be the best that they can be. In addition to all of the above, the GB cycling team were doing something different to their competition, and I think that also contributed to making them outstanding. Dave Brailsford and his GB cycling team bought home 7 gold medals at the London 2012 Olympics. Tell that to anyone who doesn’t see the value in incremental innovation. 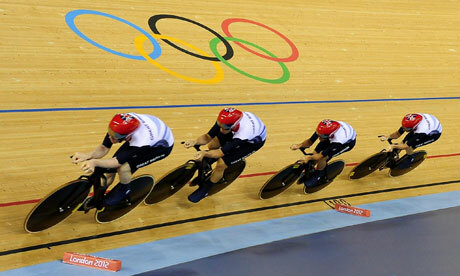 What tactics can you borrow from the GB cycling team and apply to your fundraising? This entry was posted in creativity, fundraising, Innovation, Inspiration, leadership, London2012, not for profit, passion, remarkable and tagged ballet, cycling, Dave Brailsford, fundraising, incremental, Innovation, London2012, Olympics, pillow, sport, Team GB. Bookmark the permalink.